Victory! This photo was taken after the hotel workers learned that their 51-day strike resulted in a collective bargaining agreement both parties could live with. 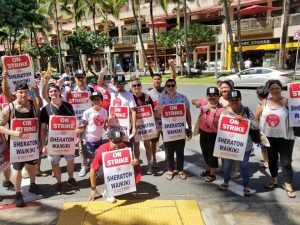 On November 27, the Local 5 hotel workers’ union successfully ended a 51-day strike against five prominent Kyo-Ya-owned, Marriott-managed hotels. It was a long and difficult battle, but workers are calling this a huge victory. Besides wage and benefit increases, the new agreement provides for improvements in safety, security, work load, and establishes an assistance fund for child and elder care. Their resolve and unity, standing firm in their fight for fair wages is a great example for us and all labor organizations. 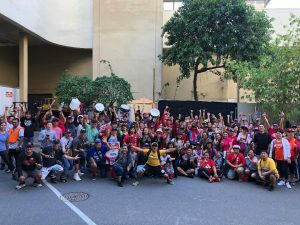 As Local 5 has assisted us generously in the past, the Musicians’ Association made a donation to their strike fund and several musicians were ready to join the strike lines musically had the strike continued.